External cladding is a versatile method of weather proofing the walls of a building while providing a simple way to enhance its look. Cladding panels are made from a variety of material including timber, aluminium and uPVC. UPVC is an excellent low-cost alternative to wood and aluminium because it can be manufactured with different finishes to imitate timber finished. 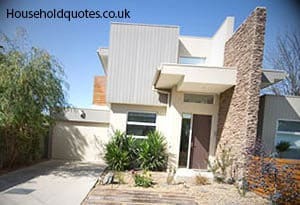 Builders apply cladding where there is a need to create an external skin that serves as a decorative finish too. Cladding will work whether the wall finish is traditional brickwork, block or timber framing. When it comes to making your home stand out, or blend in with the surroundings, you could go for paint or coloured render. If you are looking for a simple textured finish, then the two options mentioned earlier will probably do. Available in a broad range of colours and finishes giving you a world of options to create your desired look. Upvc is a durable and weather-proof material so your house will look stunning for longer with little maintenance. Enhances your home’s thermal insulation that helps to retain heat and prevent excessive heating costs. Upvc is water resistant and unlike timber is not susceptible to rot so your investment will last you a long time. Lightweight and easy to work with so you can install it DIY if you have the right tools and equipment. The biggest factor affecting uPVC cladding prices is the type of cladding you choose, whether you settle for plain white uPVC cladding panels or you select a timber effect cladding board. Installers will often quote their prices per square metre of coverage so the bigger your house, the more you can expect to pay. Upvc is one of the cheapest forms of cladding, although the high-end versions may approach the same price as timber cladding. For white uPVC cladding, you can expect to pay around £10 per 5m length. The price above excludes the cost of all the accessories required for the installation. Black ash effect or Rosewood effect uPVC cladding is also available, and prices will start at £18.99 per 5m for Black ash and £24.00 for Rosewood. Additional costs for installation may include the erecting of scaffolding for access to upper floors where required. Always ensure your quotes include not just the uPVC cladding prices but all associated costs as well. The biggest challenge with providing accurate reference pricing exterior for uPVC cladding, other than requesting a quote from an installer, is the wide range of house sizes in the UK. For the purposes of giving you a better idea of house cladding prices we will use the example below. Basic white shiplap uPVC cladding and all required accessories. Labour for two tradesmen working for two days. Removal of any waste material from site. Upgrading cladding type from plain white uPVC to a more decorative timber effect cladding type. The size of your house and the extent of cladding you need installed. DIY or professional for exterior wall cladding? Cladding looks great on surfaces of all types, including porches or garages. The products themselves are easy to use and require little regarding specialised tools. If you are an accomplished DIYer, then wall cladding is very much achievable. Exterior wall cladding for an entire house or a multiple storey building is a different story. You will require access equipment such as scaffolding and will need more than a single pair of hands. Finding a builder with the right experience and proven track record can be hard. You wouldn’t want to spend time chasing after a builder to get work completed so using a website such as Quotatis would allow you to vet candidates before you hire them. Remember, if you are going to go for cladding the entire house with a different material that characteristically impacts its appearance, it might be advisable to speak with building control. In most cases you will get the go ahead without the need for permission. It is on those rare occasions you would want to err on the side of caution. If you have hired a professional installer via Quotatis, then they may well be able to advise you on the best way forward.